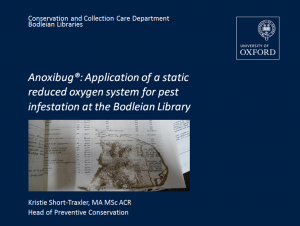 Some library and archive objects due to their inherent make-up, conservation history, fragility or other practical reasons present a problem in terms of available infestation treatment methods. In addition to preservation requirements, reduced resources require methods that are easily affordable and sustainable by various library staff with little or no training in laboratory procedures. 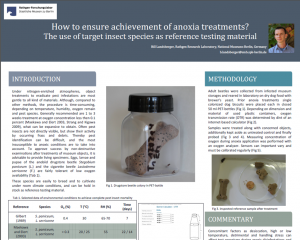 The use of Anoxibug®, a new commercial oxygen absorber from the IMC Group Ltd’s Hanwell range, is discussed. 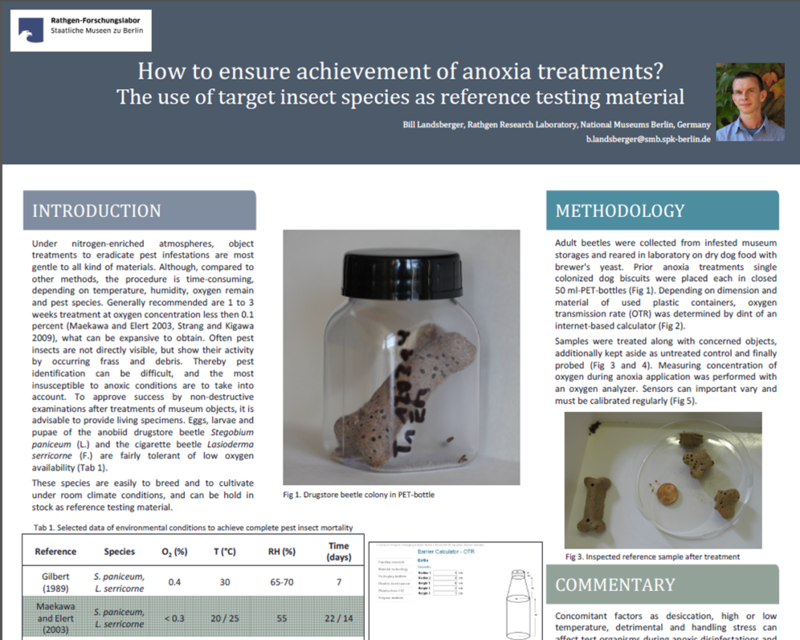 Previous studies have shown that prolonged exposure to low oxygen atmospheres is lethal to a wide range of insect species and their various developmental stages. Reduced Oxygen atmospheres have been used in three ways: dynamic, static and hybrid systems. Static systems which do not employ the additional use of an inert gas have been limited in scope to treatment volumes of 100 L or less. This is due to the fact that the previous scavengers used for oxygen reduction were very small and expensive and maintaining oxygen levels was difficult. With the Anoxibug ® system, the oxygen reduction is produced on a larger scale and the bag and indicator are reusable. The initial trial investigates the effectiveness of the system in killing larval and nymph stages of the insects as well as maintaining suitable environmental control inside the bag. We also discuss the practicality of the set-up and maintenance of the system during the treatment. Finally, the paper will look at how the initial test results are shaping future control strategies for the Bodleian Libraries. 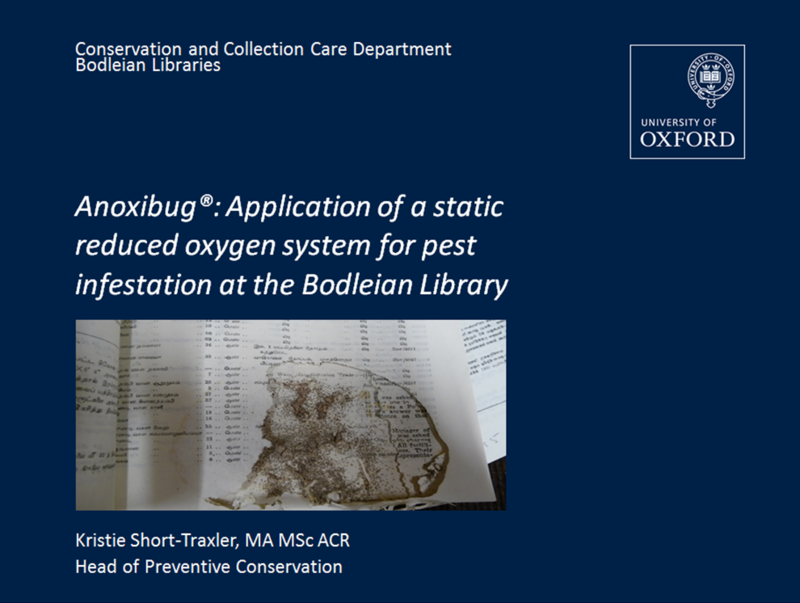 Low oxygen pest eradication using CO2 has been considered a safe method for objects of historic and artistic value. For the large majority of objects this appears to continue to be true. 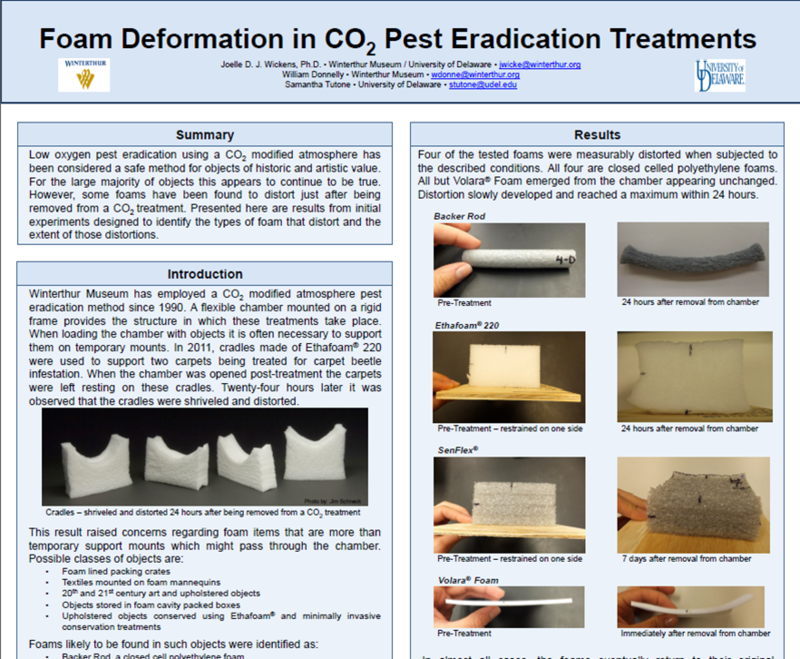 However, some foams have been found to distort during or just after being removed from a CO2 treatment. The distortion in several foams includes expansion, contraction or some of each. 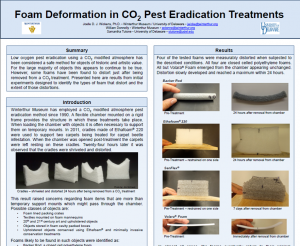 This poster will report on the results of initial experiments designed to identify the types of foam which distort and the extent of the distortions. The level of distortion is measurable and significant enough to cause visible changes in an object with a foam component. It will also loosely quantify any observed recovery from distortion, which in some cases is not complete over a year after the treatment was carried out. The current state of research seeking to determine why the distortion occurs and whether there is a way to prevent it will also be presented.